MILAN – Until very recently, Europeans paid little attention to the British referendum on its European Union membership. Now that the potential for “Brexit” has become real, they are increasingly consumed by its implications. But rather than seriously considering the risks, many are behaving like members of a large family that is about to lose a wealthy relative, mentally dividing up their inheritance even before the will is read. This is certainly the case in Italy, where many expect a windfall from Brexit, with the strongly pro-EU Prime Minister Matteo Renzi leading the way toward a more integrated Europe, with a prosperous Appenine Peninsula at its center. But such expectations significantly overestimate the benefits of Brexit for the rest of the EU, while vastly underestimating the risks. For starters, higher costs of trading with the United Kingdom, a significant importer of Italian goods, would hurt Italy’s exporters, at a time when the country is struggling to escape its worst recession since World War II. The popular expectation that neither the UK nor the EU will impose trade restrictions on the other seems unconvincing, at best, given the protectionist tendencies that have helped spur British Euroskepticism and the possibility that European policymakers will attempt to deter other member states from following the UK’s lead. Brexit would also spur significant financial-market turmoil. Again, many are downplaying this risk, claiming that the turbulence will be short-lived. Some Italian economists, such as Bocconi University’s Francesco Giavazzi, even expect substantial financial-sector benefits, with London’s demise as the main center for euro transactions giving continental financial centers like Milan a big boost. But this assessment is at odds with the experience of financial and real economic collapse following Lehman Brothers’ bankruptcy in 2008. In the decade before the post-2008 Great Recession, financial sectors across Europe became deeply integrated – a process that brought major benefits to the City of London. Though London already had a major comparative advantage as a global financial center, Britain’s EU membership boosted its standing considerably, by enabling it to gain secure access to the eurozone’s financial infrastructure. London-based financial institutions now have access to the euro payment system, and the European Central Bank’s opening of a swap line with the Bank of England (BoE) further minimized the risk of a liquidity crunch. If Britain leaves the EU, liquidity risks could skyrocket, requiring dependence on the ECB swap line, just as the US Federal Reserve had to back the dollar market in Europe through swap lines with the ECB after the Lehman collapse. And the risks of such a challenge to Britain’s financial sector would be even greater, because derivatives markets, which comprise a large share of financial transactions in London, are extremely sensitive to liquidity issues, and because euro-denominated transactions in London are massive, relative to Britain’s GDP. Furthermore, the UK’s loss of access to the eurozone financial infrastructure would highlight the fragility of a financial market defined by such a huge currency mismatch, potentially triggering panic among investors. Given all of this, it seems reasonable to expect Brexit to produce a large financial shock. For Italy, where the banking sector has yet to recover fully from the last financial crisis – and, indeed, remains burdened by a huge volume of non-performing loans – such a shock would be devastating. Add to that youth unemployment rates of more than 40% and incomes at the level they were at 16 years ago (and below pre-2000 levels), and the “Roman Europe” that some envision seems highly unlikely to emerge. After all, how much good will it really do to attract a few more clearing houses to Milan, when turbulent financial markets are increasing the spreads on bank lending and government bonds? Will the hundreds of thousands of young Italians – often talented, educated, and hard-working – who have lately flocked to the UK looking for work benefit from those small gains when they are forced to head back home, unemployed? All of this speaks to a final major risk that could arise from Brexit: the invigoration of populist movements, with their dangerous nationalist message. Their leaders, having long blamed the EU for Italy’s economic struggles, would surely try to spin the consequences of Brexit to turn citizens against Europe. To be sure, such claims would be false. The real impediment to stability and prosperity in Italy are the powerful interest groups that have long resisted needed reforms. In fact, the country would be worse off outside the EU, which implicitly imposes some limits on the interest groups’ power. But if, in their desperation, Italians and others succumb to the populist temptation, the entire European project could be jeopardized. Italy would hardly benefit from having marginally more influence in a disintegrating EU, even if Milan did have a few more financial services firms, employing a few hundred more highly paid professionals. It is time for Europeans to start taking seriously the financial, economic, and political threats that Brexit actually poses. Otherwise, when they finally do read their departed relative’s will, they might find themselves empty-handed – and facing a legacy of liabilities. As investors push long-term yields lower, banks suffer, and technical indicators suggest more pain. Banks do not like flat yield curves. But if the current trend continues, they are going to get one. The spread between 10-year Treasury rate and the two-year rate continues to narrow. In the traditional model, a bank borrows money at short-term rates and lends it out at long-term rates. When there is little differential between the two, there is not much profit potential. And charts of bank stocks bear that out. 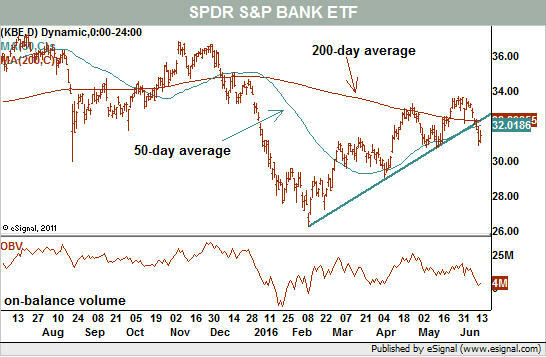 For example, the widely followed SPDR S&P Bank exchange-traded fund recently dropped below the rising trendline that had guided it higher since February (see Chart 1). In doing so, it also broke down below its major moving averages and now looks to resume the larger decline that had been in place since July. Compare that with the Standard & Poor’s 500, which not only remains in a rising trend since February but is still, despite a bad few days, within striking distance of all-time highs. Indeed, while the index has regained all it lost at the end of last year, the banking sector has only regained about two-thirds of its loss. Long-term charts using weekly close data show an even scarier picture. A double top pattern formed by twin highs last year was broken to the downside and the 2016 rally has successfully tested that move (see Chart 2). Pundits are quick to blame fears of “Brexit” – the United Kingdom leaving the European Union – for softness in banks. For European banks, it is gasoline on the already-burning fire. But banks both here and there have been in decline for quite some time. The breakdown in the bank ETF was just the next step in what is an ongoing bear market. Banks of all sizes seem to be in the same boat. Some, such as SunTrust managed to regain a higher percentage of their late 2015 losses and exhibit relative strength. That means they could lead the way if the sector gets the bullish news it wants. 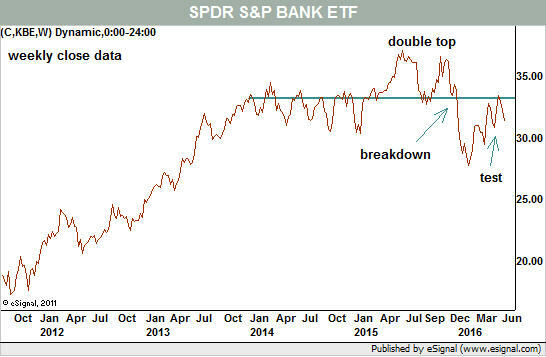 Most stocks, however, and even the SPDR Regional Banking ETF, have charts that are very similar to the bigger KBE sector ETF. Regional banks have on-balance volume profiles that are a bit more bearish, and on the regional ETF itself this indicator has already set a new low for the year. This even as prices are only a little more than 3% off their recent high. Technically, that is bad news for the bulls as money never really flowed in during the rally, and it is already flowing out in a big way. 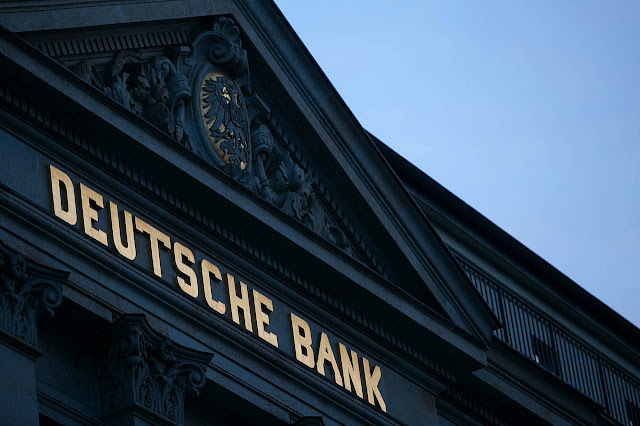 Some of the big banks in Europe, including Deutsche Bank ( DB ), are already trading below their financial crisis lows. That shouldn’t come as a surprise given that the yield on the benchmark 10-year government bond (Bund) went negative this week. Clearly that is a difficult environment for lenders. For now, we first have to see how the market digests its initial reactions to the Federal Reserve’s decision Wednesday to leave interest rates unchanged. Right now investors are worried about a Brexit, and that means that if U.K. residents vote to remain in the EU next week, then a relief rally – and a big one – is always a possibility. As I wrote here Monday, however, the bond market, specifically the spread between short- and long-term interest rates, is a more important problem for the sector. Gold has been billed as a ‘wonder investment’ in portfolios: apparently it can help protect against inflation or deflation, political, financial or economic chaos and much more besides, so it’s no wonder that we’re seeing interest in this commodity soar at the moment as investors find themselves in a moment of political turbulence on both sides of the Atlantic. However, some caution is warranted here. Odysseus famously plugged his crew’s ears with beeswax and had himself strapped to the mast to resist the call of the sirens. I would simply suggest that gold should occupy no more than low single digits in percentage terms as a proportion of your total investible assets — calls to hold significantly more, no matter how honeyed the voices, should be strongly resisted. Perhaps the most alluring part of gold’s story right now seems to be its role as a safe port in the storm. In a world seemingly beset with more than usual levels of monetary, economic and political uncertainty, gold, with its thousands of years of practice as a store of value, seems to shine brightly as an investment prospect. Most would agree that a safe asset should have a relatively stable value during times of market stress. If we assume that such times tend to see equity markets fall sharply, gold’s historical record over the long run is far from perfect on this count. Even without that blemished relative record, investors should be wary of havens where the price has jumped around so dramatically — even when just viewed over the past five years. Nonetheless, if enough investors believe gold to be a haven then it may well act as one. Some argue that gold is not for protection against expected changes in inflation, but rather the unexpected. This is more difficult to weigh, as the tricky procedure of decomposing inflation into its expected and unexpected components is more art than science. However, based on some (admittedly crude) empirical work, the long-run relationship between gold and unexpected inflation looks entirely unremarkable. One area where there is an undeniably strong relationship is between gold and real bond yields. The basic argument here is that the relative attraction of gold wanes as the real yield available on other, more plausible, havens rises. Why would you buy gold, which throws off no cash flows or coupons, when you can lend the US government money with a yield above inflation? As real and nominal bond yields have plunged lower this year, gold has prospered. We see inflation picking up over the course of the year, particularly in the US economy. Revolving credit is picking up, wages are too and just as oil prices exerted significant downward pressure on inflation indices over the past two years, they will exert upward pressure as we continue to annualise those dramatic falls. We suspect that as inflation starts to return, a less historically remarkable term-premium for government bonds may also follow, pushing real yields higher. We would hesitate to suggest how quickly such a risk premium would return, however, this sits behind our recommendation that gold should not occupy large parts of a diversified investment portfolio. There is perhaps some irony that the recent recovery in oil prices has sown the seeds for gold’s future underperformance. Nonetheless, our preferred route in commodities is the diversified one. China’s ongoing property market bounce is likely to help sentiment across the space even in the face of still unappealing inventory statistics and supply demand balances. For those looking for a port in the storm, cash and short-term bonds remain the best option, nominal values will remain constant even if real values won’t. To protect against the kind of inflation that we are currently envisaging, equities have historically proved to be the most consistent bet. - The Fed's Labor Market Conditions Index tells us that the jobs market has deteriorated substantially since the initial interest-rate increase in December 2015. - This corroborates the deterioration in a completely different series of labor market data that I introduced in January. - It is very unlikely that labor market condition improve between now and the end of the year. - I see no more interest-rate increases from the Fed in 2016. Most investors would agree that the unemployment rate, which was reported to be 4.7% in May, isn't the best indicator of broad labor market health. It isn't a very good leading indicator either, considering that the last time it fell to 4.7% was in November 2007, just two months before the onset of the Great Recession. The Federal Reserve clearly agrees, which is why it created a more broad-based labor market indicator in 2014 to address the shortcomings of the unemployment rate. 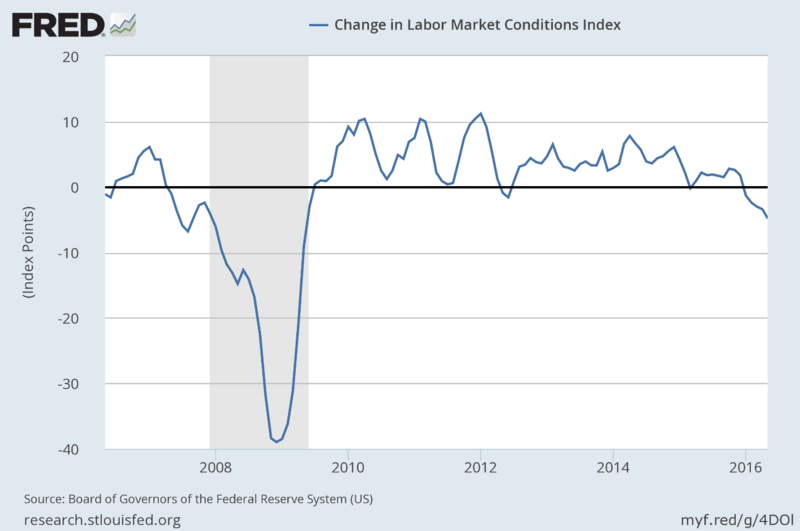 The Labor Market Conditions Index, or LMCI, is comprised of 19 different labor market indicators. While this index accounted for the drop in the unemployment rate last month, it also accounted for the increase of more than 400,000 in what are called involuntary part-time workers. In other words, these are individuals that are looking for full-time jobs, but can only find part-time work. A complete list of all 19 indicators that comprise this index can be seen below. 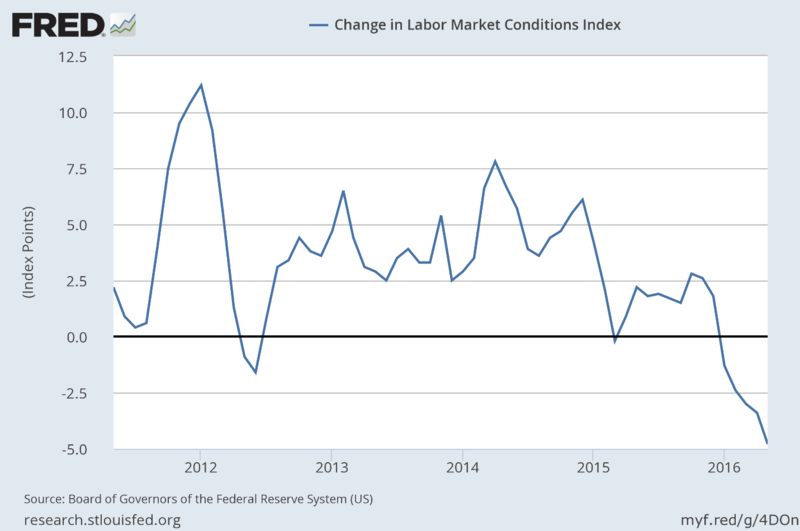 The index decreased to a reading of -4.8% in May, which indicates deteriorating labor market conditions, and was the worst reading in seven years. While this index was initially introduced in 2014, the data series was compiled going back to 1976, so we can look at it in a historical context. 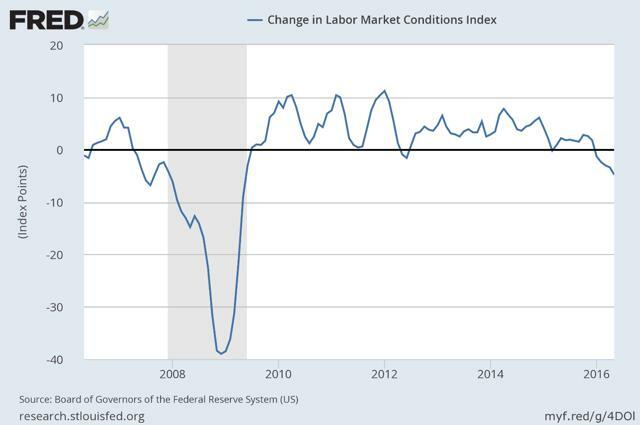 What is notable in the chart below is that this deterioration began immediately following the Fed's initial interest-rate increase in December 2015. If we take a longer-term view, as can be seen below, you will notice that the current downturn in the index looks very similar to the downturn that we saw in 2007. This corroborates the deterioration in a different series of data, which I introduced at the beginning of this year. In what I referred to as our "revision index," the rising number of negative revisions to the initial estimate of the number of jobs being created each month by the Bureau of Labor Statistics was a warning sign. 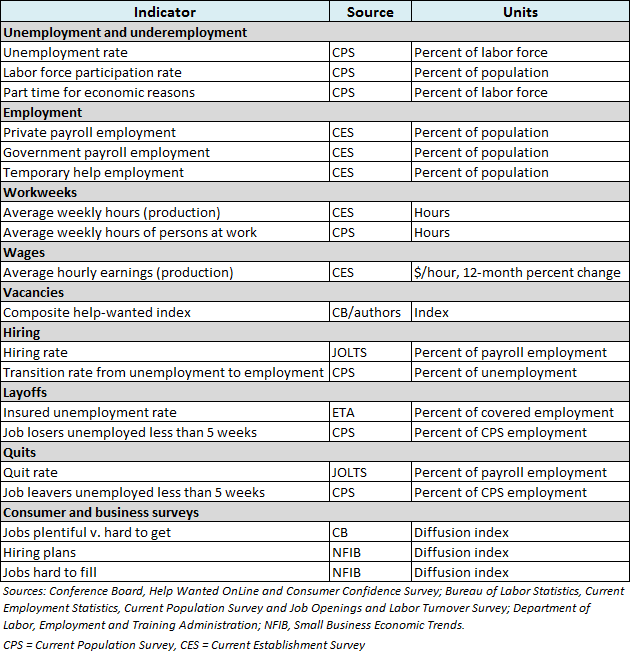 This data is not one of the 19 components of the Fed's Labor Market Conditions Index. It told me in January that the labor market was weakening, when the Fed and the consensus of economists on Wall Street were asserting the exact opposite. Why then do members of the Federal Reserve Board, as well as Fed Chair Janet Yellen, continue to suggest that the economy is at, or near, full employment, and that the economy continues to strengthen? I have no idea, but I am certain that they realize conditions have deteriorated since their initial interest-rate increase, and that they probably missed the opportunity to further normalize interest-rate policy. While jawboning financial markets over the past six months, they have been in a wait-and-see mode. I am also certain that these conditions are not going to improve between now and the end of the year. As a result, I do not think that the Fed will raise interest rates in 2016. 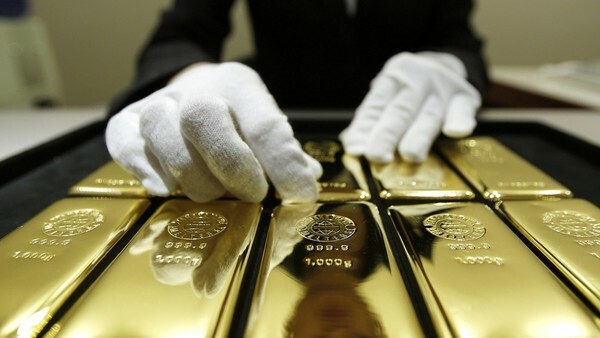 A solid bid returned to the Gold sector this past week as the market saw a solid Gold Rally. And the GLD ETF alone added more than 15 tons of Gold. The precious metals Miners, which had fallen 10% from their recent Cycle highs, rallied to recover all of their losses, and to print new 2016 highs. Considering that the Dollar also moved sharply higher last week (and continued to start the week) out of its own Cycle Low, the action in the Gold market is surprisingly bullish. If Gold were destined to decline for one more Daily Cycle into an Investor Cycle Low (ICL), I would have expected a rising Dollar to be the catalyst to send it lower. If a new Gold ICL were not in play, there would be no reason for the Miners to make new highs, or for Gold to slice upward through its 10 and 20 day moving averages. Although I'm not willing - yet - to entirely rule out the possibility that Gold's current DC could fail and drive price lower into an ICL, that's not what the evidence currently supports. Admittedly, my last call for a possible $200 Gold Rally did not exactly pan out and that trade was stopped out. The key difference here is that call was, as clearly noted within the post, based more on a chart pattern and did lack Cycle's confirmation. With this current setup, the Cycle's picture is well defined. In fact, the evidence is significantly lopsided here. None of the action here resembles the type of behavior you would see in a final, failing Cycle. The technical indicators (10dma cross back over 20dma - MACD bull cross - Strong RSI) and great price action (nearly $100 off the bottom) both point to only the first Daily Cycle of what is generally a 20-25 week Investor Cycle. If that's the case, we could see an additional 10-15 days of generally higher prices as Gold rallies toward a typical day 20, 1st Daily Cycle top. There are still a few bearish indicators to contend with, however. For several weeks, we watched the COT report thinking that it might need to fully reset before we had an ICL, and that didn't happen. Plus, sentiment has moved upward, and is again at a level that is highly elevated. Nevertheless, when we view these metrics from the perspective of an extreme bull market, it's clear that their current levels are not out of an expected range. There are many encouraging signs of a new Gold Investor Cycle. The Gold Miners' bullish percent index ($BPGDM) had dropped to 50%, matching the level that accompanied ICLs while Gold was rising out of its 2008 low. Subsequent ICLs registered very little sell-off in the Miners, and it was not until 2010, a full year after the bear market low, that the Miners saw a real decline. Last week's rise in the Miners to a 2016 high is very much like the lock-out rallies the Miners saw after the 2008 bear market low. Gold is looking increasingly like it's in a bull market. We should not be surprised - the world's central banks are clearly struggling to contain deflation as they become increasingly involved in different debt markets. The central banks' purchase of debt has driven yields to near-collapse, with the sovereign debt (out to 10 years) of most industrialized nations trading at negative rates. It's little wonder Gold is catching a bid! Why would investors pay to own a risk-off asset like bonds, one which will not appreciate with inflation, when they can own Gold free and clear with no counter-party risk? On the weekly chart, we see a clear low on Week 26, which is perfectly timing for an ICL. We had a relatively mild 1-month decline into the ICL, but it was significant enough to be a bottom. In total, we have more than enough evidence (by early bull market standards) to support a new Investor Cycle. I believe that we're going to see a big 2nd leg higher in Gold this summer. I want to reiterate my belief that everyone should hold a solid, long-term position in both bullion and the Miners, positions that are being held for the long term Gold Rally and not traded with the Cycles. Progressive proselytizing at top universities may explain why so many Jews and Asians are liberals. Several reasons are typically given for Jewish loyalty to the Democratic Party: President Harry Truman’s post-World War II support for Israel; the socialist tendencies brought by Eastern European Jewish immigrants; fear of Christian anti-Semitism; and the Jewish attachment to tikkun olam (literally, “repair of the world,” but often conflated with social action). So what accounts for the predominance of liberalism among both Jews and Asian-Americans? Perhaps it’s higher education. In the U.S. population at large, the possession of a college or postgraduate degree has been a predictor of Democratic Party affiliation. We believe, in particular, that the liberal leanings of many professors at elite schools likely play an important role. Jewish and Asian parents have long pressed their children to attend top universities. Despite obstacles like higher standards for admissions, both groups are disproportionately represented at those schools. Though they account for only about 2% of the U.S. population, according to Hillel’s Guide to Jewish Life at Colleges and Universities, Jews represent 10% of undergraduates at Princeton, 12% at Harvard and 27% at Yale. 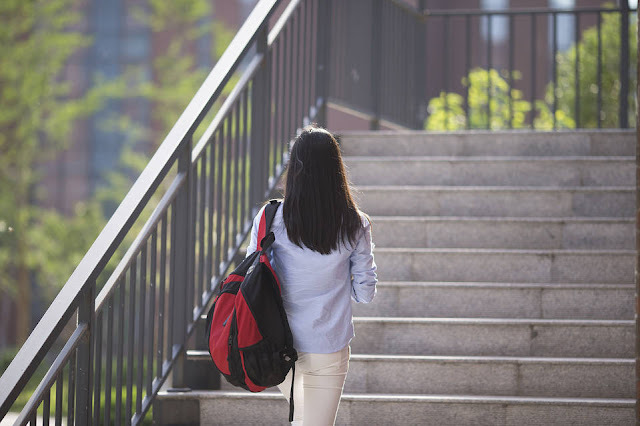 Asian-Americans are about 5% of the U.S. population, yet make up 22% of the class of 2019 at Princeton, 21.8% at Yale, and 21.1% of the admitted class at Harvard. The progressive proselytizing during the college years doesn’t always have the intended effect: Both authors of this piece emerged from Ivy League institutions as staunch conservatives. One of us even teaches at an elite university. But we can also attest to the veneration these schools were granted in our childhood homes. Will this trend continue in the decades ahead? It’s impossible to say, but it’s not too soon for Jewish and Asian freshmen to start thinking about where their long-term interests lie. To them we say: Congratulations on your achievement, but don’t let it cloud your political judgment. Now that you’re heading to university, you need not sublimate your own views to impress your professors or others around you. College is an opportunity to explore, question and think—not merely to accept as dogma all that is heard in the classroom and on campus. While parents have every reason to be proud as well, they should maintain a watchful eye. Those college-tuition payments should be going toward their children’s education, not their indoctrination. Mr. Troy is a presidential historian and former White House Jewish liaison under George W. Bush. Mr. Chen is a research fellow at the Hoover Institution, lecturer in public policy at Stanford University, and was policy director to the Romney-Ryan 2012 presidential campaign. COLORADO SPRINGS – Every day, policymakers around the world face a dizzying array of choices. The more they spend on, say, education, the less there is to run hospitals, fight pollution, or boost agricultural productivity. Lobby groups, activists, and the media promote certain causes – solar panels, the Zika virus, closing tax loopholes immediately – while less fashionable issues, like nutrition or non-communicable diseases, can slip beneath the radar. And most countries’ politics have proverbial “third rail” issues – policies or programs (say, state pensions) that are so sacrosanct that any policymaker who touches them faces instant political death. Part of the problem is that when governments invest in economic analysis, they tend to do so for one policy at a time, asking simply: would this be cost-effective? Yes? Let’s do it. But what if policymakers looked at a range of options simultaneously – comparing bridge-building with spending on school textbooks – to figure out where first to direct any additional money? This approach was used for the first time at a national level last month in Bangladesh, where my think tank, the Copenhagen Consensus Center, collaborated with BRAC, the world’s largest development organization, on the Bangladesh Priorities project. The idea was to provide constructive input to the Bangladeshi government and donors by determining where extra resources would do the most good. Bangladesh has been making immense strides. Economic growth has averaged nearly 6% over the last decade, and the poverty rate has declined rapidly since the 1990s. Gains in average life expectancy have been astounding, steadily rising from around 48 years in 1980 to more than 70 years in 2014. The country has many compelling policy options, making our initiative even timelier. Beginning in early 2015, the Bangladesh Priorities project commissioned dozens of teams of specialist economists from Bangladesh and around the world to study 76 concrete solutions to improve the country’s future. Education economists, for example, analyzed the best education solutions for Bangladesh, estimating the costs and benefits of each. Last month, an eminent panel of four top economists – three leading Bangladeshi scholars and a Nobel laureate in economics – met in Dhaka to examine the results. Having read all the research, the panel spent three days discussing and challenging the findings with the specialist economists. So, when the education economists provided an analysis on putting children into classes according to ability, the eminent panel would question the assumptions and probe the outcomes to see if the finding stood up. The panel identified some remarkable investments. At the top of their list of priorities was treatment of tuberculosis, which kills about 80,000 Bangladeshis annually – one in every 11 deaths in the country. The main cost comes from getting almost 60 million more people screened, but it is indeed a cheap disease to treat: Spending just about $100 per patient on standard drugs and community clinic follow-up can avert TB transmission. The total benefit is at least 21 times higher than the total cost. When one considers the impact on families of not losing their breadwinner, and on communities of not losing their experienced workforce, the real benefit could be even higher. In second place was e-procurement, a digital solution implying improved oversight of the 720 billion takas ($9.1 billion) the government spends each year to pay for everything from new bridges to pencils. Creating something similar to an online bidding system can boost competition and reduce corruption, lowering government costs by an estimated 12%. And the relatively low cost of implementing e-procurement implies low risk. Each taka of spending stands to do more than 600 takas of good. Early nutritional interventions, which are vital in determining long-term outcomes, were ranked third. Nearly one in four children in Bangladesh under the age of five are malnourished to the point of being stunted, which hinders mental development, lowers school performance, and leads to lower productivity, worse health outcomes, and more disease later in life. The benefits of nutrition-focused improvements are estimated to be 19 times higher than the costs, which are low. When we say what should come first, we also need to say what should not come first. This may seem uncaring. But if we do not prioritize explicitly, we end up spreading resources thinly, or allow opaque bureaucratic processes and the vagaries of media attention and the pressure of lobby groups to prioritize for us. For Bangladesh, the panel pointed out that cervical cancer, for example, should not come first. This is hard. It kills about 10,000 Bangladeshi women each year; but it is very costly to treat. More than twice as many women die from TB, which also kills many men and children. Obviously, the goal is for Bangladesh to be able to respond effectively to both challenges. But if it needs to start somewhere, the analysis shows that money that could save one person from dying of cervical cancer would save nearly 50 from dying from TB. What works best for Bangladesh will not necessarily work best for, say, Colombia, Finland, Haiti, or Canada. But the same analytical approach can be used – and extended to cities, states, and regions. Economics should never be the sole decision-maker. But without evidence about costs and benefits, decisions are made in the dark. Providing a price list helps elevate the conversation about priorities. Bangladeshis – and people everywhere – deserve the most efficient allocation of scarce development resources that can be achieved.